Over the course of the past year, gambling in New York has begun to undergo a transformation as part of a larger plan to help modernize the upstate economy. Governor Andrew Cuomo highlighted the need for growth in the region, which has been suffering “decades of decline,” in his January 2013 State of the State address. Citing job statistics, the Governor noted that the upstate region has significantly lagged behind both New York City and the nation in job growth the past ten years. To help revitalize upstate economy and address these needs, on June 19, 2013, Governor Cuomo and the New York Legislature announced an agreement on the Upstate New York Gaming Economic Development Act, which would lift a ban on Las Vegas style casinos and enable the State to auction off up to four casino licenses over the course of seven years. Since its inception, the New York State Constitution’s general prohibition against gambling has slowly changed to incorporate forms of gambling through various exceptions, such as lotteries operated by the State to support education and pari-mutuel betting on horse racing that produces revenue to support the government. The greatest change occurred in 2001 when the State passed legislation creating a video lottery program for certain racetracks (racinos), authorized six Indian casinos, and permitted New York State to enter into a multi-state lottery game. Racinos, like traditional casinos, offer games such as craps and baccarat, but provide a very different player experience because all games are automated. Each component of the 2001 expansion was legally challenged but upheld in Dalton v. Pataki. The court found that because Congress had preempted the states under the Casino Gaming Regulatory Act of 1988, allowing tribes the exclusive right to regulate gambling on Indian lands, and because New York allowed similar forms of casinos for charitable purposes, the Indian-run casinos were valid. More notably, the court ruled that there was no violation of the State constitutional gambling prohibition by authorizing video lottery terminals or the participation in an interstate lottery because both met the conditions under a state-run lottery exception passed in 1966. Because non-automated Vegas style casinos would not fall under the same lottery exception that enabled racinos and are not located on tribal land, the State constitution needs to be amended to repeal the prohibition against gambling. Any amendment to the New York State Constitution must be passed in both houses of two consecutive legislatures before it is submitted to the people of the State for a vote. Last year the State legislature took the first step by voting in favor of the constitutional amendment in both houses. The Upstate New York Gaming Economic Development Act, which was also passed by both houses, is the second step in the amendment process. Incorporated within the act is the final component of an amendment, a referendum that will allow the residents of the State to vote on the amendment in the fall of 2013. In order to support the expansion of gambling, New York recently consolidated the New York State Racing & Wagering Board with the New York State Division of Lottery into a single state agency, the New York Gaming Commission. Effective since February 1, 2013, the Commission provides a centralized regulatory body that will help increase efficiency, reduce costs, and eliminate redundancies in oversight. The seven member Commission oversees four divisions: the Division of the Lottery; Charitable Gaming; Gaming (including Indian Gaming and Video Lottery Gaming); and Horse Racing and Pari-Mutuel Wagering. The Upstate New York Gaming Economic Development Act outlines the general plan for expansion. It authorizes four upstate “gambling destination resorts” which will be selected competitively based on the economic development impact the resort will have on each region. The legislation calls for the creation of Resort Gaming Facility Location Boards (RGFLB), which will select up to three applicants for the newly created Gaming Commission to choose from in granting a facility license. The legislation outlines the criteria the RGFLB will utilize to make its decisions, weighed 65% based on economic activity and business development factors, 20% on local impact and siting factors, and 15% on workforce and societal enhancement factors. After vetting all of the applicants, the Gaming Commission will have final say on which applicant is selected for a license. The three regions selected for development – the Hudson Valley, Capital District, and Eastern Southern Tier – were carved out based upon recent deals struck with the Native American tribes that operate casinos in New York. The State, in exchange for new casino revenue sharing parameters with each tribe, granted seven-year exclusivity zones surrounding each of the Indian casinos where no new developments can be built, thereby protecting each tribe’s investments from competition. Even with enabling legislation in place, two challenges remain. Economically, the plan needs to attract investment from both casino operators and surrounding businesses in each area chosen for development. This is a relatively minor issue as each region saw potential interest after the passage of the legislation. Foxwoods officials recently announced that they are prepared to build a $300 million casino resort in the Hudson Valley. Both Tioga Downs Casino located in the Southern Tier, and Saratoga Casino and Raceway located in the Capital District, have shown strong interest in expanding their racinos into full-fledged casinos. As a condition to development, emphasis has been placed upon creating world class destination resorts to help increase tourism in the regions. Incorporated within the siting criteria to be utilized by the RGFLBs, bidders are encouraged to create developments to operate in partnership with and promote local hotels, restaurants, retail facilities, and live entertainment establishments so that patrons can experience the full diversified regional tourism industry. A larger issue remains as current sentiment among voters concerning the referendum is split. A Quinnipiac University poll shows that 48% of voters across the State feel as though the creation of non-Indian casinos similar to those in Atlantic City and Las Vegas are a good idea. Approval was slightly less in New York City where 46% percent of voters supported the plan. The New York City vote will be especially important due to an expected increase in voter turnout as residents will be electing a new mayor for the first time in over ten years. In order to win over the city vote, a portion of the tax revenues generated by the plan will provide education funding for the entire State rather than each specific region in which the casinos are located. 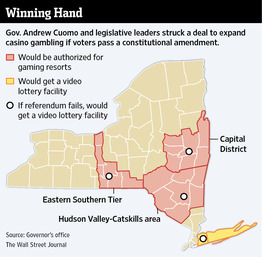 Regardless of whether the referendum passes, gambling in New York will still increase. The Act also authorizes the New York Gaming Commission to establish up to four video lottery gaming facilities across four regions (Catskills, Capital District, Nassau County and Southern Tier) based upon revenue generation and economic development criteria.